, an eminent astronomer and mathematician, was born at Salfeldt in Thuringia, a province in Upper Saxony, the llth of October, 1511. H^ studied mathematics under James Milichi at Wittemberg, in which university he afterwards became professor of those sciences, which he taught with great applause. After writing a number of useful and learned works, he died February 19, 1553, at 42 years of age only. His writings | are chiefly the following: 1. “Theorize novae Planetarum G. Purbachii,” augmented and illustrated with diagrams and Scholia in 8vo, 1542; and again in 1580. In this work, among other things worthy of notice, he teaches (p. 75 and 76) that the centre of the lunar epicycle describes an ovalfgure in each monthly period, and that the or hit of Mercury is also of the same oval figure. 2. “Ptolomy’s Almagest,” the first book, in Greek, with a Latin version, and Scholia, explaining the more obscure passages, 1549, 8vo. At the end of p. 123 he promises an edition of Theon’s Commentaries, which are wry useful for understanding Ptolomy’s meaning; but his immature death prevented Reinhold from giving this and other works which he had projected. 3. “Prutenicse Tabulae Ccelestiurn Motuum,” 1551, 4to; again in 1571; and also iii 1585. Reinhold spent seven years labour upon this work, in which he was assisted by the munificence of Albert, duke of Prussia, from whence the tables had their name. 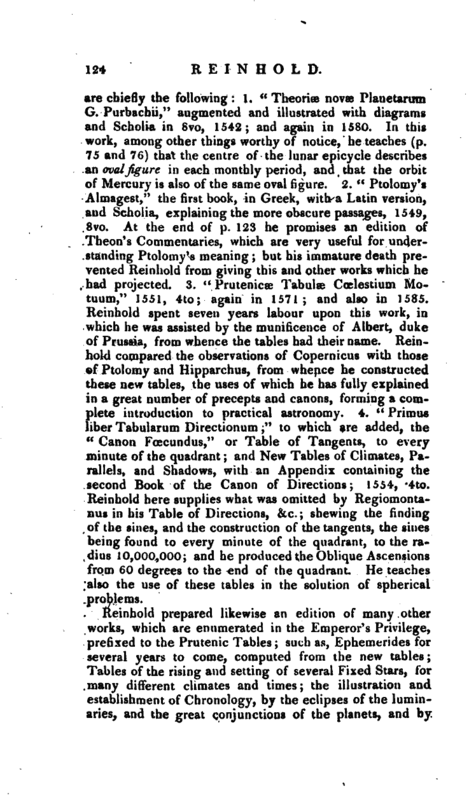 Reinhold compared the observations of Copernicus with those of Ptolomy and Hipparchus, from whence he constructed these new tables, the uses of which he has fully explained in a great number of precepts and canons, forming a complete introduction to practical astronomy. 4. “Primus liber Tabularum Directionum” to which are added, the “Canon Fcecundus,” or Table of Tangents, to every minute of the quadrant and New Tables of Climates, Parallels, and Shadows, with an Appendix containing the second Book of the Canon of Directions; 1554, 4to. 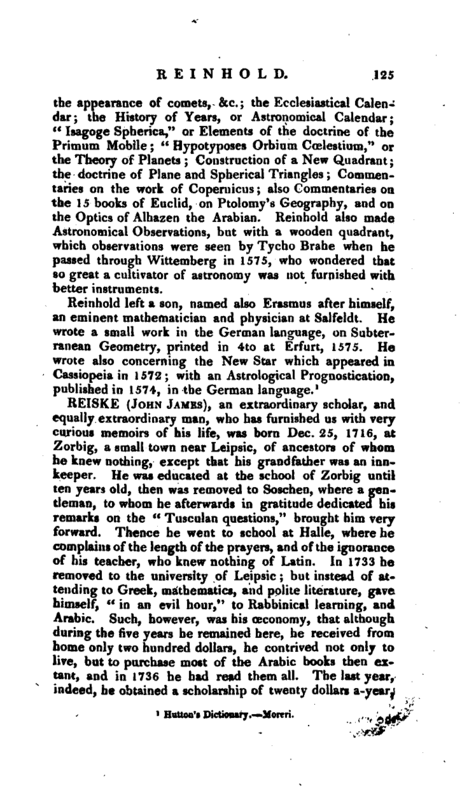 Reinhold here supplies what was omitted by Regiomontanus in his Table of Directions, &c.; shewing the finding of the sines, and the construction of the tangents, the sines being found to every minute of the quadrant, to the radius 10,000,000; and he produced the Oblique Ascensions from 60 degrees to the end of the quadrant. He teaches also the use of these tables in the solution of spherical problems. 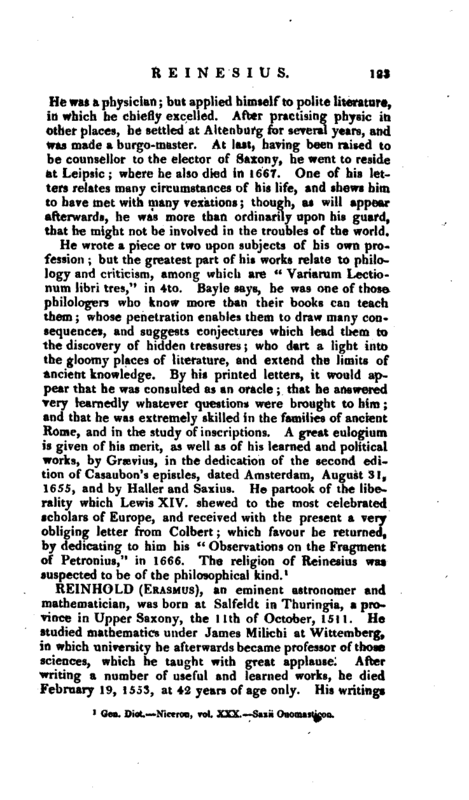 Reinhold prepared likewise an edition of many other works, which are enumerated in the Emperor’s Privileg;e, prefixed to the Prutenic Tables; such as, Ephemerides for several years to come, computed from the new tables; Tables of the rising and setting of several Fixed Stars, for many different climates and times; the illustration and establishment of Chronology, by the eclipses of the luminaries, and the great conjunctions of the planets, and by | the appearance of comets, &c. the Ecclesiastical Calendar; the History of Years, or Astronomical Calendar; “Isagoge Spherica,” or Elements of the doctrine of the Primum Mobile “Hypotyposes Orbium Ccelestium,” or the Theory of Planets Construction of a New Quadrant; the doctrine of Plane and Spherical Triangles Commentaries on the work of Copernicus also Commentaries on the 15 books of Euclid, on Ptolomy’s Geography, and on the Optics of Alhazen the Arabian. Reinhold also made Astronomical Observations, but with a wooden quadrant, which observations were seen by Tycho Brahe when he passed through Wittemberg in 1575, who wondered that so great a cultivator of astronomy was not furnished with better instruments.